I am slowly getting a rhythm here on the “THIS land” ( This is your land, this is my land….) I have been in one place now for 6 days and it feels so good. Thank you, everyone who has made it possible for me to actually have a place to stay before this final house sitting gig. I have new observations on most things or as I call it, my odd mainland behavior. You can read more about my “Lost in Transition” blog but here are some of my celebrated ” firsts”back on mainland. 1. I was so excited that regular gas was so inexpensive. I then realized that no one in Marin actually uses regular gasoline for their Mercedes and so gas is as expensive as Maui. I nevah knew! 2. I went to Target to buy Flannel PJs in April. The sales person thought I was nuts. She was wearing a strapless dress and flip flops. I was in a leather coat, scarf, gloves and boots. I have been so cold, especially at night here in Northern Ca. 4. Had to have some fish for dinner. Mahi, Mahi was 17.99 a pound, FRESH! Yeah, and what do they call FRESH? 5. My headstand this morning was a bit kapakai. I have not been in the water “cross crawling” to integrate my body now for over a month. Right and left side integration is a little differen, land locked. This is the hardest transition. I did make it to the local YMCA for a mouthful of chlorine and a foggy goggle lap swim, however. That felt OK. I have also been taking a lot of salt water baths before I go to bed. 6. I turn the heat off at night because that makes sense when you live on an island. Only after talking to someone about the temperature and energy savings for my new job, did I realize that it was odd to wear a wool cap to bed. She laughed and called me Ebeneezer. After almost 3 years in the jungles living as much as a yogi hermit as a white girl from Chicago can I can honestly say, I am odd. But tomorrow is another day and although I believe I have found a great part-tine job opportunity, tomorrow is Easter. Peeps or not. OK, I got it. I’m temporarily lost. In the dark without a flashlight. I feel off balanced and do not want to move to another place or ship boxes and make new friends and feel odd about returning to familiar faces and shy about the ones I have yet to meet. I’m done for the day in creating a sparkely, improved life for myself by physically relocating my job, home and always with the highest justification of “letting go of that which no longer serves…” I already need a vacation from this newest adventure and this is only one week into of my latest transition. I express all of this because even though I have a regular yoga practice, I still wake up every morning sharing the planet with real people like myself going through the same things. Even now I can feel the charge begin to dissipate and I am mindful of my breath. I know that all I have to do is get on my mat and it will shift. That is the beauty of practice and purification of the monkey mind, full of it’s story and drama. However, I also know that many of us are going through transitions and by sharing some of my frustrations with a sense of humor, insight and some years of wisdom, I may help others…for the benefit of all beings. Moving and change is stressful and what I’m going on about is the part that most people don’t talk about when they make wonderful, exciting and positive changes in their lives. This is the flip side of the good news and wonderful opportunities and it can look many ways and have many different flavors depending on how much sleep you have had. Today, mine just didn’t taste good at all and to make matters even more bitter, I was painfully aware that I created it all…and I am the only one responsible. The only one creating suffering, is me. Even as I recommit to ease and grace, I see a habitual pattern of drama and suffering. What to say about transitions? …it is the only constant and in our flow of life, it is natural to connect one event to another. Nature has it hardwired into her program and we call it “the seasons”. It is a normal process in moving from point A to B as my engineer dad would say. So what’s the big deal? We resist. I resist and thus create suffering. We think it is supposed to be easy and that nothing unexpected will happen. That means we have a “story” of what is is supposed to look like and when it doesnt flow that way, it feels like…well however it feels. When I see that, I see just how crazy making it is and how unessary it is and how I have all the yoga tools to change it very quickly. Want to join me? Want to find out ways to manage those transitions in your life that grab a hold of the root of your hair and then swing you around just enough for you to realize its your own hand? Good. I have some things to share because apparently I have been studying this topic for the last 5 years on a very consistent basis. I also want to hear what you have to say as well. Between us, I know we can come up with solid ways for all of us to manage and even enjoy those little things like misplaced car keys…. ( you know what I am talking about) as well as those big events that completely alter our reality. I know a few things about that as well. Stay tuned for the next installment of Lost in Transition. Here I am, three weeks into my transition from Maui life to Mainland life. I completed the yoga therapist training on Mount Madonna in the first two weeks, as planned and traveled through Northern California with a stop in East Bay for a couple of days. Now I am at Lake Tahoe. I would like to say all is fabulous and I am excited about my new adventures and I will and I am and then there is the other side. I certainly expected to feel a bit uprooted, out of the ordinary routine of my life, however, I didn’t plan on feeling like I just landed on another planet. I keep referring to ” A stranger in a strange land” because It feels so odd. Unusually sensitive and alert, I feel like there was a microchip planted in my head and whoever is in charge ( clearly not me) has not updated the program. So, once I touched down in San Jose and traveled to the retreat center at Mount Madonna, it took me about 4 days to just feel my hovering feet on the ground. And then when I did and looked down, I saw I still had my flip flops on! Even as the rain began in the Santa Cruz mountains and the wind blew me around…it took me two more days to change my shoes and put on my waterproof jacket. Now that is some strong habit energy! So now I am at Incline Village, Nevada, over looking the magnificent lake. I am feeling only slightly more grounded in the woods of these native trees and granite rock. And I have created some quiet time to reflect and integrate from the many places I have dragged my self and luggage over the last several weeks. On my walk this morning, a cat crossed my path and I was reminded of my own two cats, Abbott and Romona. I remembered when my husband and I moved from Chicago to California back in 2000 and we enjoyed our driving adventure cross country. When we picked the cats up from their plane ride a week later, they were clearly not very happy with their version of the adventure. “Cat attitude”, the vet told us and suggested we keep them in one room, together, for a week to help with their transition. It was so cute how Romona found a place to “ball” up in the corner of the closet and Abbott decided to become the smallest 20lb cat to fit under the covers in the middle of our queen sized bed. That was rather funny, actually. On the second day after their arrival, we ran out of food decided to switch them to some new“organic” cat food…Marin style. Unfortunately, that was not the best digestive idea and I quickly went back to the grocery store and got the food they were accustom to. I should have known better. I marveled at how their natural instincts, although a bit odd, took care of them and finally after three weeks, they emerged as furry balls of love once again. So I thought, why should I respond any differently then my cats did through their transition? Even though I seemingly have a larger brain, I was feeling just as freaked out. There was a difference, however. I talked about it to relieve some of the discomfort and rationalized the mind chatter with Sanskrit translation and Sutra explanation. But even with all that human response, I was still displaying some similar behaviors. 1. Hide under the covers-Get more sleep than you normally would. 2. Eat good, simple food- Keep it as close to your own diet, BT ( before transition). 3. Be around people who you love and who love you– Even if you pull a little “attitude” they will understand. Then love them back even more. 4. Allow yourself some odd behavoir-Laugh at yourself when you notice it and if you can’t, go back to number 1. This wisdom has made a big difference in the compassion I hold for myself through this time. Even though I am heading into new opportunities, there are just some things that are unknown and weird and it helps to have a few more tools in my bag. One of my teachers at the training said this about transitions….”They spotlight the habit energies you would not normally see in your day to day life routine. It can become a tapas of purification if you are aware”. May all your transitions be this insightful to your practice of living yoga and I look forward to hearing about how you make your way through. The following meditation is based upon the mantra “so hum,” (“I am that”) used within the traditions of Tantra and Vedanta. Mantra, the chanting of sacred words or sounds, is a central part of yogic meditation. Mantra comes from the combination of two syllables: “man,” meaning “to reflect” or “be aware,” and “tra,” meaning “tool for” or “agent of.” A mantra is a tool for reflection and the cultivation of awareness, and is used for both concentration and contemplation on the Source. Within yoga, mantras are based upon sounds that reflect the energy of our divine nature. Om is considered to be the universal, consummate mantra. The following meditation is based upon the mantra “so hum,” (“I am that”) used within the traditions of Tantra and Vedanta. Since “so hum” also indicates the sound of the breath, it is a mantra that repeats itself effortlessly. Find a comfortable posture for meditation (seated on a cushion or blanket, in a chair or against a wall). Place your palms facing up in jnana mudra (forefinger and thumb touching) with your palms facing up to open your awareness or facing down to calm the mind. Scan your body and relax any tension. Let your spine rise from the ground of the pelvis. Draw your chin slightly down and let the back of your neck lengthen. Bring your attention to the tidal rhythm of your breath, feeling the rise and fall of your inhalation and exhalation. As your focus settles on your breath, begin to employ the simple mantra “so hum.” As you inhale, say “so” silently to yourself, and as you exhale say “hum.” Keep your focus on the sensation of your breath while silently repeating the sacred syllables, “so hum.” As you drink your inhalation, gently drawing your breath along the base of your throat, listen for the sound of “so.” As you exhale, listen for the sound of “hum” as your breath is amplified in the throat. Let your mind become absorbed in the sound of so hum-in your internal chanting and your actual breath. As if you were watching the waves of the ocean, let your mind be naturally drawn into presence and stillness—no place to go, nothing to do, so hum, so hum. If a thought (vritti) arises, come back to the mantra so hum. In the beginning, it may be helpful to set an external timer for 10, 20, or 30 minutes so you are not distracted. When you are finished, bring your hands together in anjali mudra (prayer position) and close with a moment of gratitude, reflection, or prayer to soak up the energy of your meditation into your being and life. You may wonder why in heavens name is there SPAM in this headline let alone in my diet? I am glad you asked because, I LOVE SPAM! That’s right. All the unknown meat substances aside and all the preservatives unnoticed, I really love this stuff. This morning after my Tai chi chih class I stopped at the local Hawaiian market and there it was. A little warmed up slab supported by a bed of white rice wrapped in seaweed. “This looks good, but it is not sushi, what is it?, I asked” Proudly, the cashier said, ” SPAM and it is fresh” I couldn’t help myself and said” isn’t that an oxymoron”? She chose to ignore me or didn’t get it. Ha, that was funny. It smelled good and I had a flood of memories back to my favorite camping scenes in front of the fire eating SPAM stew. I loved it! I had to get it. I felt an immediate warm pit of peace in my stomach as she rang me up. My house mate just rolled her eyes and said something like she asked God to forgive her for feeding her children that when they were young. Apparently, I didn’t either. 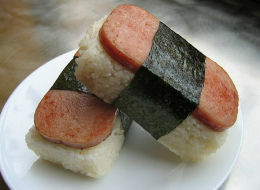 Hawaii consumes the most Spam per capita in the United States, and it was first introduced to the island during World War II. Well that would make sense but what was this interesting combo and how bad could it be? seaweed and classified as onigiri. Wow, I really didn’t know. I raced home, sat down and unwrapped it with care. Now, what to put on it? I couldn’t remember but Ketchup came to mind. (Then again, my dad put ketchup on everything) I grabbed the Braggs Aminos and poured a cup of greenjuice on the side. It looked normal enough and I was surrounding the little guy in healhty food. How bad could it be? One bite later, I knew. IT WAS DELICIOUS! As I remembered or even better. I was at peace, satisfied, happy and really pleased with myself for doing what I wanted without listening to the snickers and insults of my housemates. Afterall, if Barack Obama can eat it on a golf outing, I can eat it after a T’ai Chi Chih class. Now we really have something in common other than our Chicago roots…we both appreciate this island dish. I can also appreciate NOT having another piece for at least another century and still retaining the peace and tranquility of this moment. This is your place. Is this your peace?